Black Friday has started early this year! Check out some of the awesome sales already happening, but check back on Friday for a full list of all the best sales for Black Friday and Cyber Monday! Shopbop’s big event started today! Enjoy up to 25% off your purchase (the more you spend, the more you save) – for my sister I’m picking up this classic Equipment top (Equipment is her fave!). I’m personally excited about these faux leather pants – aren’t they fab? Just enter code BIGEVENT13 now through December 2nd and save big on all holiday gifts for everyone! Don’t forget to check out the newest markdowns, like this gorgeous Alexander Wang bag or these J Brand leather pants! Today’s the last day to enjoy 25% off your purchase at J.Crew! I just picked up this sweater in two more colors. It’s the best basic in my closet and I can’t have enough of ’em! Enter GETGIFTING at checkout and save! Saks Fifth Avenue’s sale is totally amazing. Gorgeous party-perfect pieces like this shimmering skirt or these eye-popping cobalt coated jeans are part of the sale. Obsessed! Click here to shop all the categories. I made a purchase on shopbop over the weekend I’m so mad I missed the sale, oh well.. Your picks today are all sorts of fabulous I want the sweater, boots, skirt, bag and fur throw. Loving the shade of those brown boots, fabulous round up! Once Thanksgiving is over, I am going to hit the ground running buying presents! Shopbop and JCrew sales at the same time are big trouble!! Love your picks here, especially that skirt! Fabulous picks all around! And that Saks sale is so dangerous. My wallet is suffering immensely right now. My mama would love that faux fur throw! Great picks! I just left the SHOPBOP sale a little while ago…and may head back there. So many things to covet. I adore the black skirt and Stella bag. Absolutely love the piggy bank – great interpretation of a classic! That sweater is gorgeous! And I love those booties! 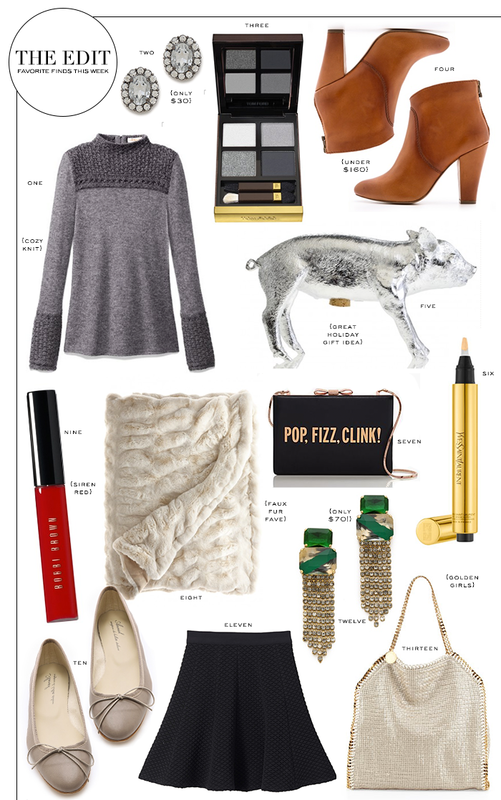 Love everything here especially that Tory Sweater! I’ve been loving that Kate Spade clutch, so freakin cute! Obsessed with that little pig! So cute!! Awesome picks! Shop Bop never disappoints!